Pesto Rosso is traditionally a Sicilian dish. I changed it up a bit for simplicity and my own personal taste . It is usually made with ground almonds. 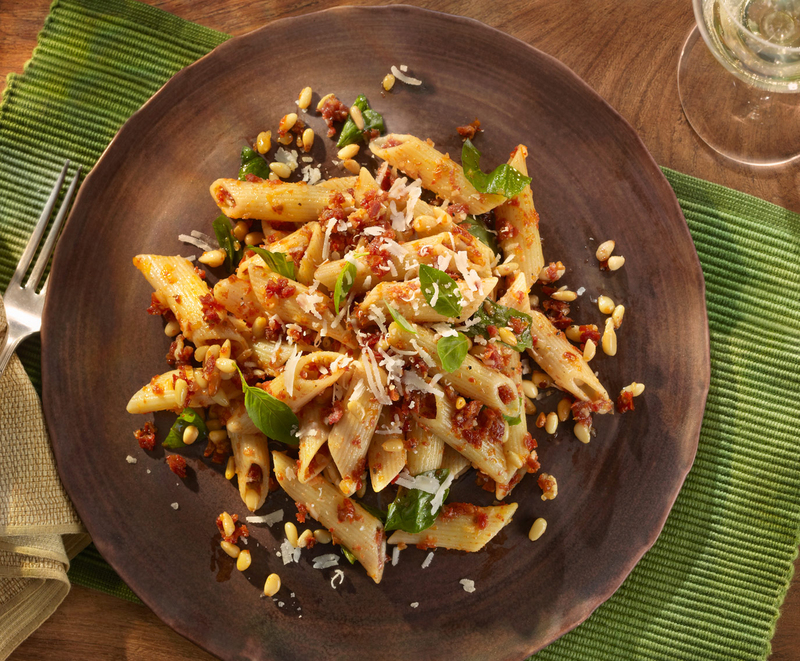 I love the rich, savory, buttery flavor and texture of pine nuts, which balance the bright sweet sun dried tomatoes and the fragrant fresh basil. I like leaving them whole for the tooth feel and the extra pop of flavor released by chewing whole pine nuts. Toasting the pine nuts in olive oil brings out their nuttiness and is augmented by the Pecorino Romano. The spicy crushed red pepper adds just enough piquancy to balance the dish perfectly. I tried this dish on a friend of mine who usually doesn’t like sun dried tomatoes. He loved it, saying it is one of the best things I have ever made. 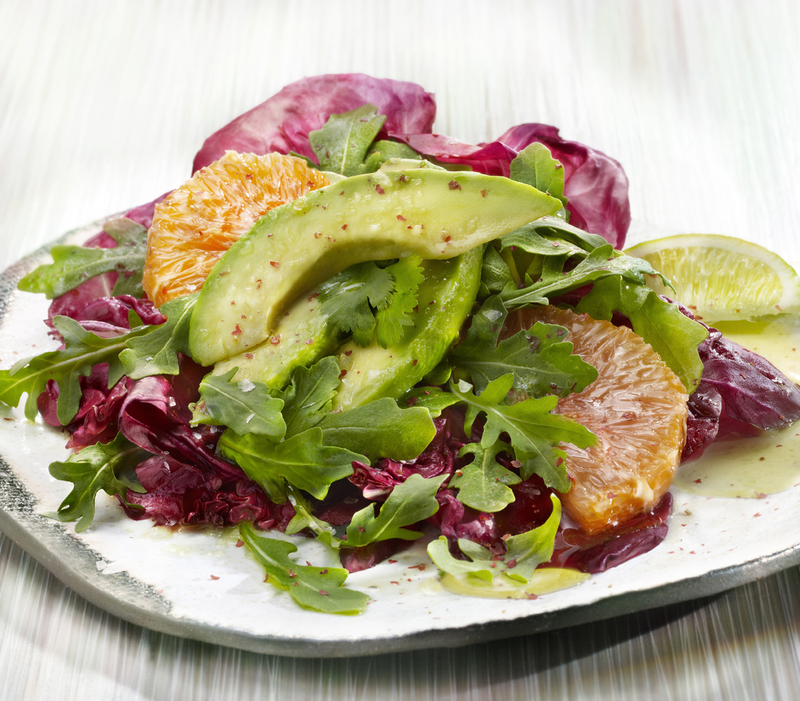 Avocados and oranges make a great pairing in a salad. The avocado is rich and creamy, while the juicy, sweet and tart orange tantalizes the taste buds. Lay them on a bed of the slightly bitter, yet velvety textured, tender magenta colored radicchio lettuce and the wild peppery baby arugula greens, add a squeeze of fresh zesty lime, and a drizzle of fruity olive oil for a melodious experience of sight & savoring. Complete the ensemble with sprigs of aromatic cilantro, freshly ground floral scented pink peppercorns and crunchy flake sea salt crystals and voila…a dreamy luncheon or dinner time side meal. In this recipe I used Cara Cara Oranges (http://www.sunkist.com/products/cara-cara-oranges.aspx ), because of their uniquely fragrant sweet exotic flavor with undertones of cranberry and a pink orange hue. They augment the avocado in color, flavor and texture. The fruit blend coordinates perfectly with the multicolored and textured mix of lettuces. 1 lime, half of it juiced, the other half sectioned into wedges. Enjoy your amazingly beautiful and delicious salad by yourself or with your friends and loved ones.